The mall of Arabia, in Cairo, Egypt, is the largest shopping mall in Africa. Close to two million people visit The Gateway Theatre of Shopping per month. Previously viewed as an underdeveloped continent, huge steps have been made to modernize Africa including the building of world-class shopping complexes and malls. The big malls have attracted blue chip companies as well as world-class unique brands. Below are some of the largest malls in Africa. Ranked as the largest mall in Africa, the Arabia Mall in Cairo, Egypt occupies a total of 267,000 square meters. Its construction is still ongoing. Owned by a Saudi Organization called Fawaz Al Hokair, it has a parking space for 9,000 cars. Located in Juhayna Square it has a total of 12 entrances. Once completed, will house luxurious hotels and modern cinema complex, international gyms and casinos, and shops that stock global products. 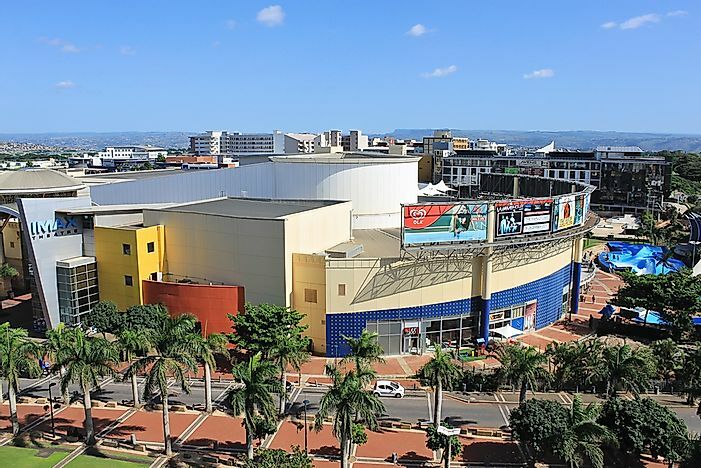 The Gateway Theatre of Shopping is a vast modern mall that was built between March 3, 1998, and September 2001 by Old Mutual properties. Its architectural design was borrowed from America. Located in Umhlanga, Durban, South Africa, it occupies a total of 220,000 square meters and has 12,000 parking slots. Close to two million people visit the mall monthly to sample over 390 stores, movie theatres, 90 restaurants, skate parks, the highest fountain in Africa, and a science theme park. The new Cairo Festival City in Egypt is constructed on 70,000 acres to ease congestion in the old town of Cairo. Developed by an Al-Futtaim Group Real Estate, the mall houses the American International School, Motor vehicle assembly units, vast office spaces, international hotels, and fabulous villa apartments. A large theatre of 1656 seats was commissioned in 2015. The Cairo Festival City Mall is located in the Festival city and occupies close to 160,000 square feet with eateries and world-renowned hypermarkets. It has numerous stalls which stock products of world-class companies. Located in Cape Town in South Africa, Canal Walk mall occupies 141,000 square meters and has over 400 outlets with a wide selection of household, luxurious products as well as jewelry. Opened in 2000, it is surrounded by a vast population that lives in over 300 luxurious homes. The landmark is the East and West Towers which provides modern office space. Tourists can enjoy a clear view of the Table Mountains and the famous Robben Island. Occupying a total of 131,000 square meters with 6,500 parking slots, the Mall of Africa is located in Waterfall city, Midrand, Gauteng. It is rated as the biggest single phase mall in Africa. The mall is owned by the Atterbury Property group and has a magnificent hotel overlooking the Waterfall City Park. The architectural design was borrowed from geology in Africa, mainly the rain forests, minerals, deserts, lakes, and oil. Tenants include household names in the world like the Woolworth. Owned by the Pareto Ltd and Liberty Holdings Limited, the shopping mall is among the oldest centers. Sandton City Mall opened its doors to the public in September 1973. It occupies 128,000 square feet with over 300 stores. Rated the Africa’s most prestigious mall, a shopper will obtain virtually everything under one roof, including all types of food. The outstanding tourist attraction is the Nelson Mandela Square. Located in Nairobi, Kenya, the mall derives its name from two rivers that streams near it. It occupies 65,000 square meters on 1,700,000 million square feet of land that also has modern residential houses, world-class hotels, and a 3,600-seat amphitheater. The mall is located just 29 kilometers from the Jomo Kenyatta International Airport opened its doors to the public in February 2017. It is the largest mall in Central and East Africa. The malls are made of world-class spectacular architecture that attracts tourists from across the world as well as bringing products close to the people of Africa. This has improved the living standard and made investors tap from the growing African economy. The malls are also popular among the locals who stream in, especially during weekends for various activities such as shopping and other fun activities. Malls are slowly becoming the center of attraction in Africa.